Author(s): Sanjiv Kumar, Aakash Deep, Balasubramanian Narasimhan. Faculty of Pharmaceutical Sciences, Maharshi Dayanand University, Rohtak-124001, India. Pyrimidine and its derivatives are present in many of the bioactive aromatic compounds that are of wide interest because of their diverse biological and clinical applications. The utility of pyrimidines as synthon for various biologically active compounds has given impetus to these studies. 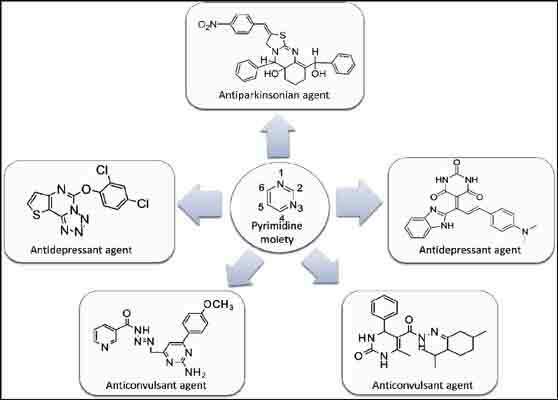 The review article aims to review the work reported on pharmacological activities of central nervous system (CNS) such as anticonvulsant and antidepressant, which created interest among researchers to synthesize variety of pyrimidine and their derivatives. The present study shows, objective of the work can be summarized as pyrimidine derivative constitute an important class of compounds for new drug development. These observations have been given novel idea for the development of new pyrimidine derivative that possess varied biological activities. This article aims to review the recent works on pyrimidine moiety together with the biological potential during the past year. Keywords: Bioactive aromatic compounds, CNS activities, pyrimidine derivatives. Keywords:Bioactive aromatic compounds, CNS activities, pyrimidine derivatives. Abstract:Pyrimidine and its derivatives are present in many of the bioactive aromatic compounds that are of wide interest because of their diverse biological and clinical applications. The utility of pyrimidines as synthon for various biologically active compounds has given impetus to these studies. The review article aims to review the work reported on pharmacological activities of central nervous system (CNS) such as anticonvulsant and antidepressant, which created interest among researchers to synthesize variety of pyrimidine and their derivatives. The present study shows, objective of the work can be summarized as pyrimidine derivative constitute an important class of compounds for new drug development. These observations have been given novel idea for the development of new pyrimidine derivative that possess varied biological activities. This article aims to review the recent works on pyrimidine moiety together with the biological potential during the past year.